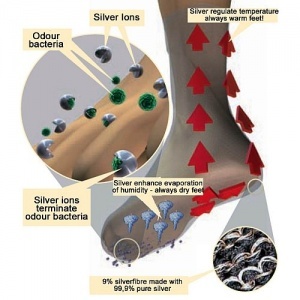 The Raynaud's Disease 9% Silver Socks are ideal for those suffering from Raynaud’s Disease as they are proven to help keep your feet and toes warmer. Pain of nerve damage to the feet and also toe ulcers can affect both genders of all ages. 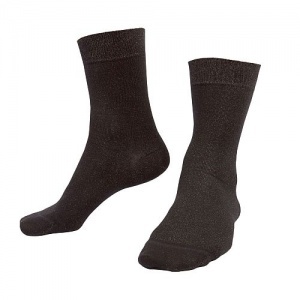 These socks can help where there is constant cold, numbness, tingling and pain which commonly affects feet and toes which can be extremely serious and dangerous. The Raynaud's Disease 9% Silver Socks help to provide medical benefits and natural healing which can help to ease any suffering and pain and also keep your legs and feet warmer. Natural pure silver minimises heat loss from the legs and feet by actively reflecting 95% of the body’s energy back to the skin. These socks contain natural pure silver and will keep your legs and feet much warmer when compared to conventional socks. Silver also stores the body’s heat, has a low radiant heat loss and therefore keeps your skin warmer to help you deal with Raynaud's Syndrome. Free from any hazardous substances tested to OEKOTEX 100 standard. 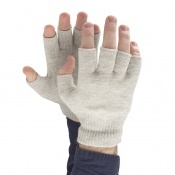 I have severe raynauds and these socks do actually work. Am ordering some more. You will not be dissappointed. These feel very nice and soft. They are quite thin so you can wear them under other socks. They hold the heat well, but of course if your feet or the socks are cold to start with they also hold onto the cold. But I think they are the next best thing to heated socks. I wear a standard size 7 but these were too long in the foot. Fortunately my husband (Men's size 8) could use them and they have kept his feet warm in the coldest day for years. He's pleased but I would have preferred them to fit me! The socks have been good. They do help my cold feet. Excellent service with rapid delivery. These socks have passed the test during the recent cold snap. They’re warm and thick, and it’s reassuring to know my toes don’t have to freeze next winter!